You've probably seen TV shows like Flip This House and Flip That House, in which Real estate investors buy, renovate, and sell a house in a matter of weeks for tens of thousands of dollars in profit. They make flipping houses look so easy that you want to jump out of your recliner (during the next commercial, of course), run down the street, find a house for sale, flip it for a 50 percent profit, and run back home to continue watching the show. I, Ralph Roberts, have flipped hundreds of houses, and it's never as easy as it looks on TV. People don't generally line up at your front door begging you to buy their house for 30-50 percent below market value. Renovation expenses always exceed estimates. And you can't always sell a house for what you think it's worth. Flipping houses for a profit requires time, money, and what I like to call sticktoitism―dogged determination in the face of overwhelming uncertainty. You can find plenty of books about flipping houses that claim \\\\\\\\\\\\\\\\\\\\\\\\\\\\\\\\\\\\\\\\\\\\\\\\\\\\\\\\\\\\\\\\\\\\\\\\\\\\\\\\\\\\\\\\"anyone can do it\\\\\\\\\\\\\\\\\\\\\\\\\\\\\\\\\\\\\\\\\\\\\\\\\\\\\\\\\\\\\\\\\\\\\\\\\\\\\\\\\\\\\\\\" and make flipping look easy and risk-free. 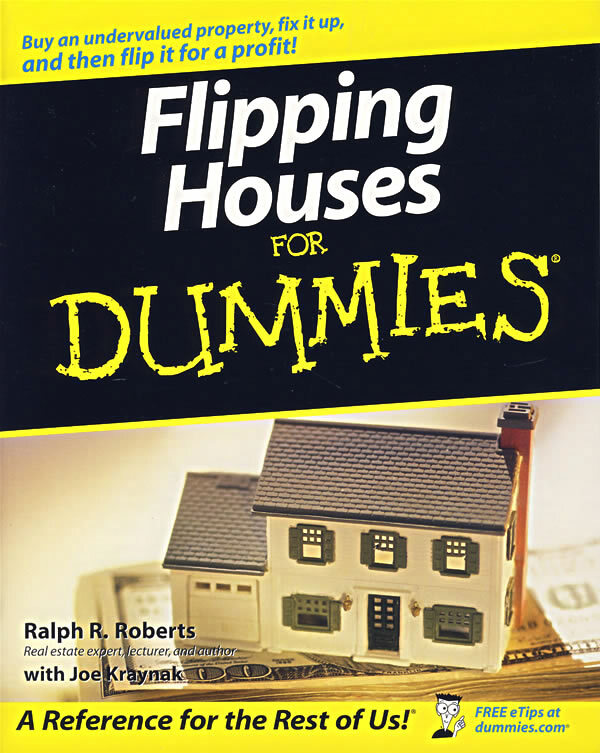 Flipping Houses For Dummies takes a different approach―honesty. We don't claim that flipping houses is \\\\\\\\\\\\\\\\\\\\\\\\\\\\\\\\\\\\\\\\\\\\\\\\\\\\\\\\\\\\\\\\\\\\\\\\\\\\\\\\\\\\\\\\"easy\\\\\\\\\\\\\\\\\\\\\\\\\\\\\\\\\\\\\\\\\\\\\\\\\\\\\\\\\\\\\\\\\\\\\\\\\\\\\\\\\\\\\\\\" or \\\\\\\\\\\\\\\\\\\\\\\\\\\\\\\\\\\\\\\\\\\\\\\\\\\\\\\\\\\\\\\\\\\\\\\\\\\\\\\\\\\\\\\\"simple\\\\\\\\\\\\\\\\\\\\\\\\\\\\\\\\\\\\\\\\\\\\\\\\\\\\\\\\\\\\\\\\\\\\\\\\\\\\\\\\\\\\\\\\" or \\\\\\\\\\\\\\\\\\\\\\\\\\\\\\\\\\\\\\\\\\\\\\\\\\\\\\\\\\\\\\\\\\\\\\\\\\\\\\\\\\\\\\\\"risk-free,\\\\\\\\\\\\\\\\\\\\\\\\\\\\\\\\\\\\\\\\\\\\\\\\\\\\\\\\\\\\\\\\\\\\\\\\\\\\\\\\\\\\\\\\" because, quite frankly, it isn't. Flipping Houses For Dummies reveals the risks and rewards of flipping properties; helps you determine whether you have the time, energy, cash, and other resources to be successful; and then conveys the expert knowledge that those who wish to pursue house flipping need in order to minimize risk and maximize potential profits in a very competitive market. Did you know? You should secure financing before you look at houses. As a flipper, you want dontwanners―houses that the owners obviously don't want. You make your profit when you buy the property. You realize your profit when you sell. Always plan on earning at least 20 percent after your total investment―purchase price, repairs and renovations, real estate agent commissions, and holding costs (monthly mortgage payments, insurance, property taxes, and utilities). Working with a top-notch real estate agent can save you thousands of dollars more than what you pay in commissions. You should choose a limited geographical area to work and then become an expert on the houses and property values in that area. Your goal when renovating a home should be to bring the property up to market standards, not exceed them. A flipping book for real people. Flipping Houses For Dummies speaks to the mom and pop investor, steering you clear of the gray areas, which tend to carry high-risks and low-returns, into safer, more potentially profitable areas. We encourage you invest in your comfort zone and take on bigger, riskier projects with higher profit potential only when you're ready. In Flipping Houses For Dummies we stress that the first flip is the most important one, and we take the guesswork out of the first transaction, to lead you through a positive first experience on which to build a promising real estate investment portfolio. Flipping Houses For Dummies provides plenty of examples of successful and not-so-successful property flips, presenting the total investment (in time and money), the work involved, and the net profit. Before-and-after photos visually illustrate the positive transformations from run-down-shacks to showcase homes.